Loneliness can have a serious impact on your health. Loneliness is a sad reality of modern life. Social media connects us to more people than ever, yet many of us feel cut off from others. In the US, health experts are warning of a “loneliness epidemic” after half of Americans – particularly young adults – admitted to feeling socially isolated. Research links loneliness to an increased risk of depression, heart disease, dementia and even premature death. One study suggests it can be as bad for you as smoking 15 cigarettes a day. Ironically, crowded cities can be the hardest places of all to find human connection. The German sociologist Georg Simmel observed this phenomenon more than a century ago, writing: “One nowhere feels as lonely and lost as in the metropolitan crowd”. While there are plenty of apps to help city dwellers make connections, one organization is trying a more low-tech approach to tackling loneliness: “street listening”. Trained volunteers from Sidewalk Talk put up signs on the street that say “Free Listening” and offer passersby the chance to share their troubles while they listen empathetically. Psychotherapist Traci Ruble started the “community listening project” in San Francisco, California in 2015, and it now has 1000 volunteers in 29 US cities and 10 countries. Ruble believes that we, as a society, desperately need more face-to-face contact, which is why Sidewalk Talk volunteers sit in chairs facing the person they’re listening to. “Loneliness shortens our lifespan ... we are meant to be in contact with each other,” she says in a video about the project. She adds that the volunteers “aren’t out there to fix anything for anyone” – Sidewalk Talk isn’t a professional counseling service – they are simply offering “human connection”. However, the organization’s leaders in each city work in the field of mental health and, if necessary, can put people in touch with low-cost or free therapy services in their local area. 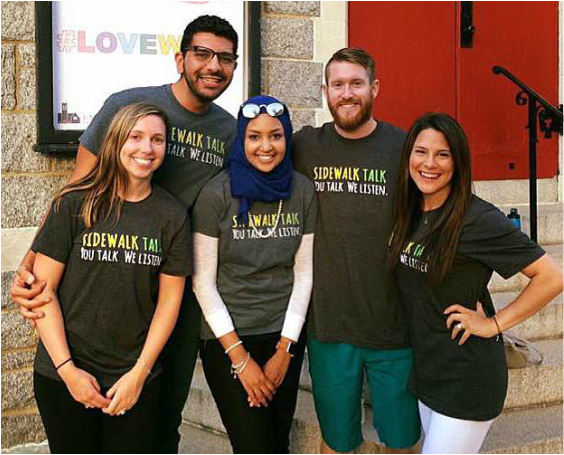 Volunteers at Sidewalk Talk offer ‘human connection’ through listening. Recent research is helping to challenge the perception that loneliness mainly affects older people. A study by the UK’s Office of National Statistics found that young adults are much more likely to report feeling lonely than those aged 65 and over. And in a US survey by health insurers Cigna, generation Z reported the highest rates of loneliness compared to other age groups. There’s a growing understanding of loneliness not only as a health issue, but a social problem. And governments are starting to pay attention – in January, Prime Minister Theresa May appointed the UK’s first Minister for Loneliness.